These poems will be published in a subsequent edition of Overland. In judging the prize, I was compelled chiefly by spirited and vital poetic language and its embodiment of an attitude towards the world, with and in the world. A public servant and adult educator for many years, KA Nelson has worked with Indigenous Australians and Torres Strait Islander peoples and organisations across Australia. Here, she reads her prize-winning poem. Overland caught up with the poet to ask a few questions. What led you to write ‘Chorus of Crows’? Yet another bad day at the office. When the ATSIC Chairperson threatened to use artworks to fund a legal challenge to some decision or other, it was more than a little unrealistic. When the government response was to take all the artwork down and hide it, I just thought, given what else was going on out on the ground, it was petty and stupid and another low point in public administration. I also wanted to say something about what happens when blackfellas and whitefellas live and work together – show how ‘grey’ things can become, how human we are, and the value of the connections that can be made. What are you hoping the reader will take away with them from reading your poem? Where do you want to take them? I hope the reader is moved to read the poem more than once, or perhaps put it somewhere safe and bring it out occasionally to share it with someone else. I guess I wanted to take the reader on a long journey that’s personal, political, and more than a little bit sad. At the same time, I wanted to show that there are times that make us feel as if we are getting somewhere. The bridge walks and the apology are good examples of that. There are just not enough of those times, yet. Racism and power-plays make the trip hazardous and the relationships more fragile. I hope readers simply like the poem – its language, imagery, rhythms and rough edges. It wasn’t a poem that emerged one morning without a struggle. I worked on it in bursts over a few years. I feel sorry for the crows – they get a bad rap, like black dogs – but in the end they were too good a device not to use them so miserably. Besides, their song is haunting and apt and ever-present. What does winning the Judith Wright prize mean to your writing practice? Winning is a great affirmation that there could be something of worth in that box under the house, something more to be said, something that might be of interest to people other than my family and friends. 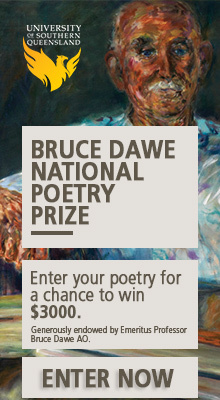 I like Judith Wright’s poetry and her interest and sensitivity to Aboriginal issues so winning a prize named in her honor is a thrill and the highlight of my writing life, which until now has taken a back seat to family, work and a really busy life. I made a decision over a year ago to write more and work less. This year I’ll be doing even more to tip the balance in favour of writing. I’m glad you like it, Gabrielle. Don’t forget to ‘share it too’! So very pleased – real recognition of real talent (which the clan recognises organically I think) – thoughtful, complex and heartfelt work – like much that has gone before… congratulations !! !